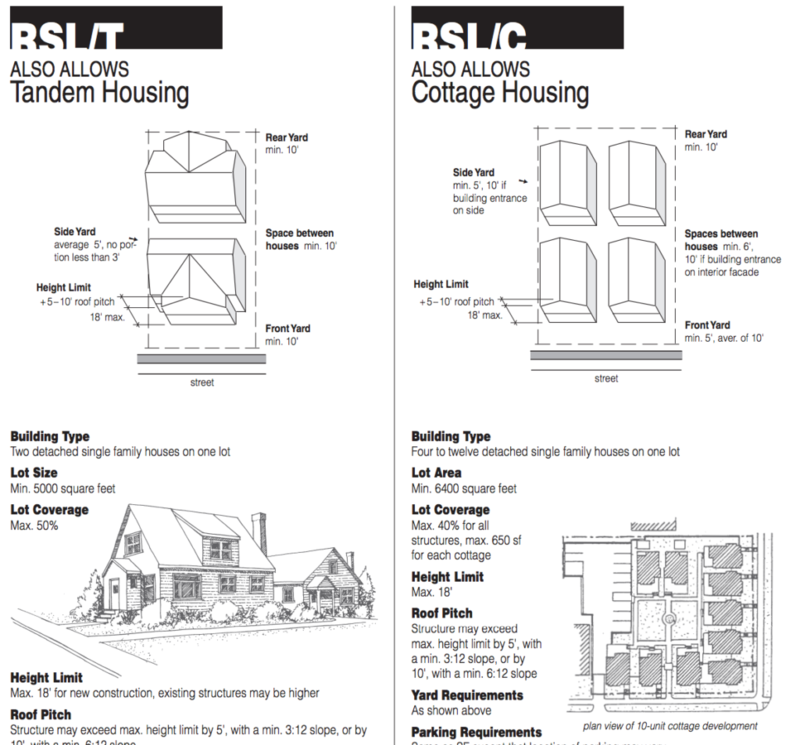 UPDATED Aug 5: Download updated renderings for Residential Small Lot, LowRise and Neighborhood Commercial that reflect the city’s current proposed buildings here. Nearly 40 people attended the July 26 presentation, “What is an Urban Village?” at the Greenwood Library last week with Senior City Planner Geoff Wentlandt. During the presentation, Wentlandt first addressed the question of why the Mayor proposes changing zoning in urban villages in the City; which he indicated is largely to drive more affordable housing and increase the market-rate housing stock in Seattle. He said many Seattleites making less than 45k a year are paying more than half of their income on housing. Mayor Ed Murray has a goal of creating 50,000 new housing units over the next 10 years to keep up with the explosive growth Seattle is experiencing; 30,000 would be market rate housing and 20,000 would be affordable housing units. Essentially, the Mayor has proposed in his Housing Affordability and Livability Agenda (HALA) that the City allow one more story in height on buildings as a tradeoff with developers for either including affordable housing units or paying a fee in lieu of including the affordable housing on-site. Additionally, single family areas within existing Urban Villages and proposed expansion areas will be rezoned to multifamily. 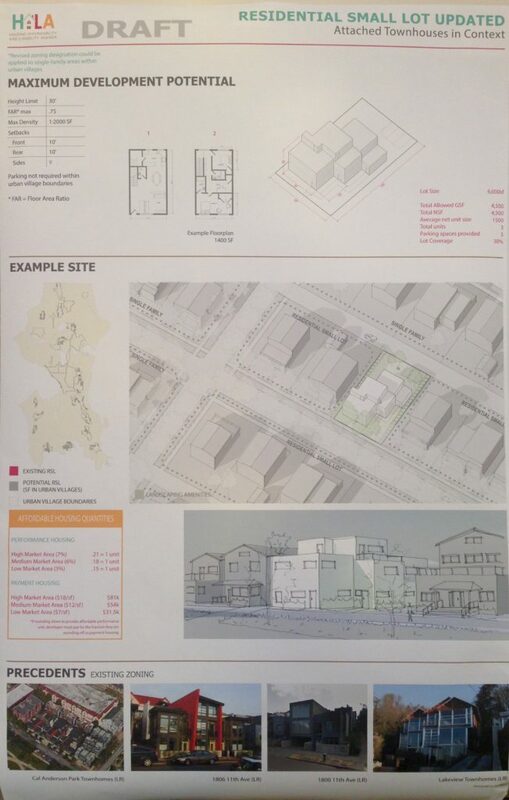 During his presentation, Wentlandt brought ideas for the Crown Hill Urban Village Committee for Smart Growth recommendation to first build up the arterials; offering the possibility of changing existing auto-centric commercial zoning to more residential friendly neighborhood commercial zoning and suggesting the group consider creating a community gathering space or plaza alongside a small commercial hub. He also walked the group through ideas on transitions between single family homes and larger multi-family dwellings, and suggested that identifying additional parks space and pedestrian access would be the types of things a neighborhood plan would consider. Finally, he let the group know that the dotted line for the expansion zone is not final and could be redrawn smaller based on the natural boundaries in our community. Wentlandt also brought a number of visuals to show the gathered neighbors what growth in current single-family neighborhoods might look like, including Residential Small Lot Zoning (small clustered cottages, duplexes and triplexes) that look like homes and examples of LowRise multifamily zoning, and offered other ideas for transition areas and setback planning for mitigating impact in current single-family zones. Neighbors attending came with good questions about improving infrastructure and planning, with many concerned that promises from the City about infrastructure improvements such as increased transit, better sewer and more sidewalks might never materialize. To that, Wentlandt indicated that the urban villages would be where the City will prioritize infrastructure investments; which is a key recommendation being pushed by Crown Hill Urban Village Committee for Smart Growth which is requesting a definitive policy to tie-in infrastructure and transit with a funding source to manage new growth. As the meeting wrapped, attendees were invited to participate in future planning events and opportunities to shape the future of our neighborhood, including a series of visioning sessions (charrettes) that will be sponsored by the City in late Fall (more details will be posted as we have them). The Committee for Smart Growth will be doing outreach to promote those events as dates are finalized.